Santa never fails. Every year, he manages to complete his rounds and deliver all the toys. Even if Blitzen is blitzed or Dasher dashes off the reservation, there are a half-dozen other reindeer at the ready, to pick up the slack and get the job done. The fat man’s team always comes through. 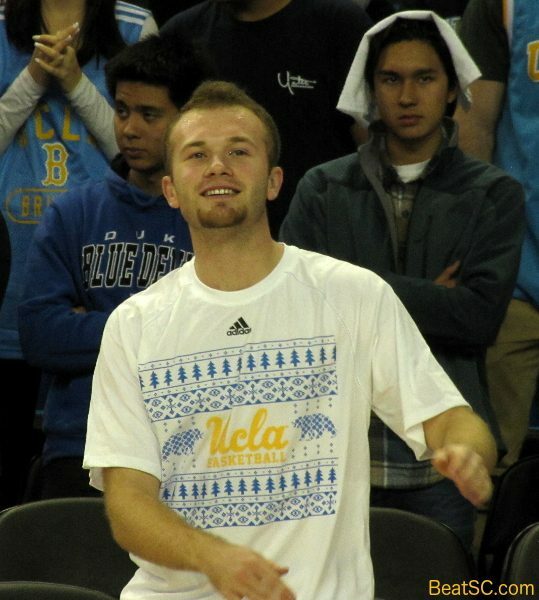 But on Wednesday night in Pauley Pavilion, the Bruins were less like St. Nick and more like St. Brick. They were never firing on all cylinders, especially from the perimeter. In a game they were favored to win by THIRTY points, it was still only a two-possession game midway through the second half. 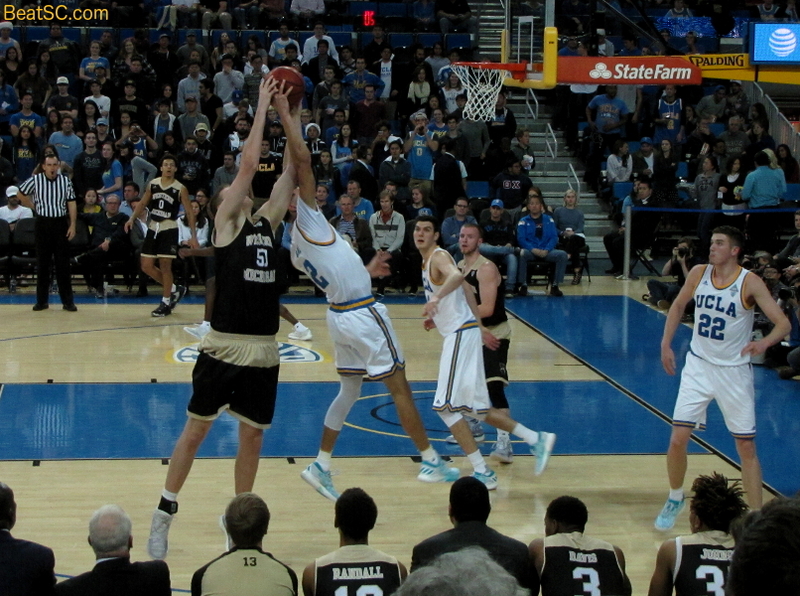 In the first half, besides being cold from the arc, the Bruins were very sloppy, committing about 10 Turnovers, which, along with uninspired Defense, allowed the Broncos to stay within 12 at the break. 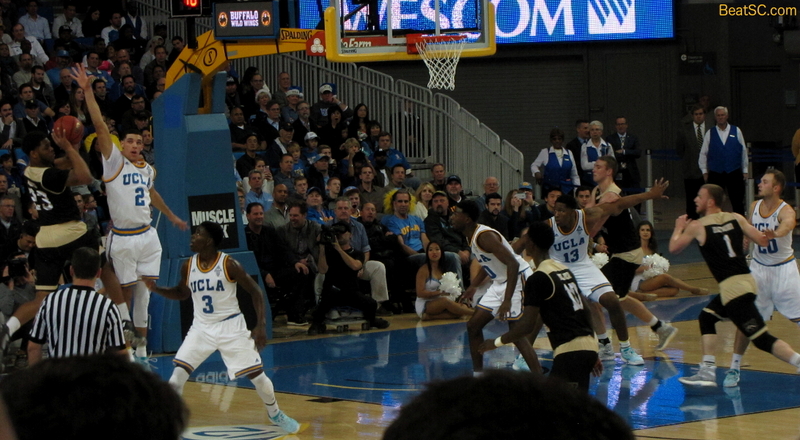 In the second half, the Bruins still struggled to pull away. Despite markedly increased intensity on the Defensive end, UCLA still found themselves in a dogfight. The lead was 10-and-under for most of the half, until there were less than 3 minutes left in the game and the Bruins finally opened it up to 18. Even great teams have off nights, when some of their players aren’t at their peak. Starting Center Thomas Welsh was still out with an injury. Gyorgy Goloman filled in admirably, but there was still a little drop-off. 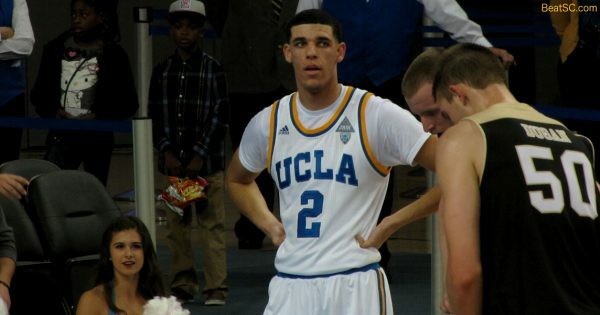 Superstud Freshman Point Guard Lonzo Ball, who is usually approaching triple-double stats, didn’t break into double-digits in ANY category on this night, and missed all 3 of his three-point attempts. Also, he had only 1 Assist in the whole first half. 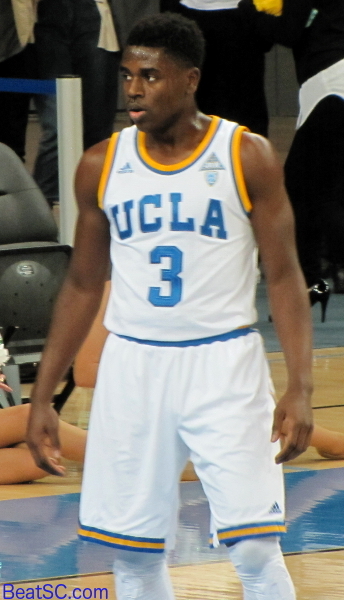 Leading scorer Isaac Hamilton continued his shooting slump, missing both of his three’s as well. 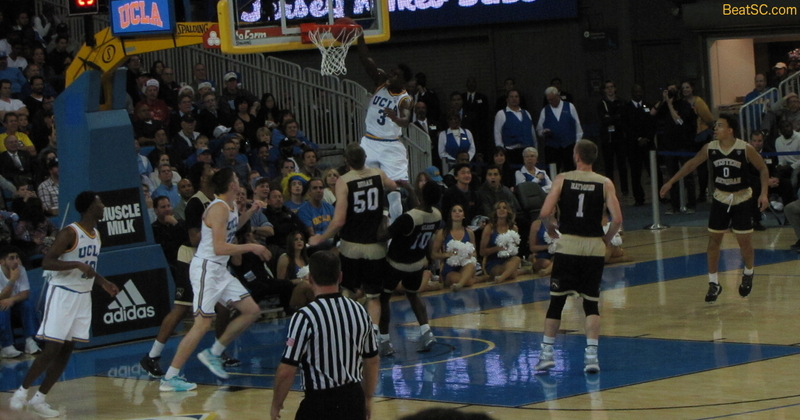 So it was up to Bryce Alford and Aaron Holiday to pick up the scoring slack… and they did. Alford scored 22 and Holiday added 16 off the bench. 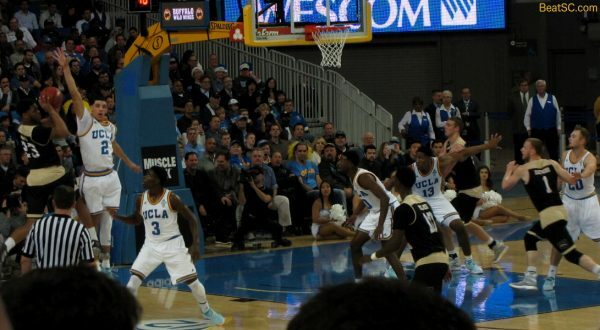 Holiday seemed to score when the Bruins needed it most, often driving to the hoop. He also had a highlight-reel dunk with about 4 minutes left that brought the house down. But Holiday and Alford weren’t perfect: They committed 4 Turnovers EACH, with Hamilton adding 3 more. Helping to overcome that was Freshman T.J. Leaf, who scored 14, and brought down 8 boards. Leaf also had 2 of the Bruins’ crucial NINE BLOCKED SHOTS. 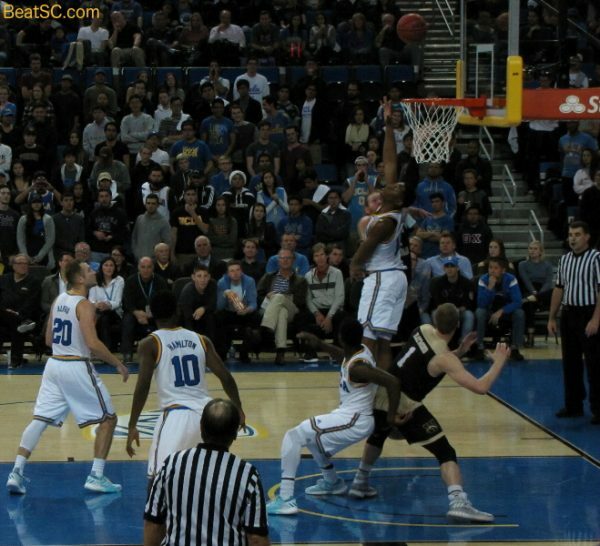 Fellow Freshman rim protector Ike Anigbogu also rejected 2 shots, and Ball swatted away THREE. 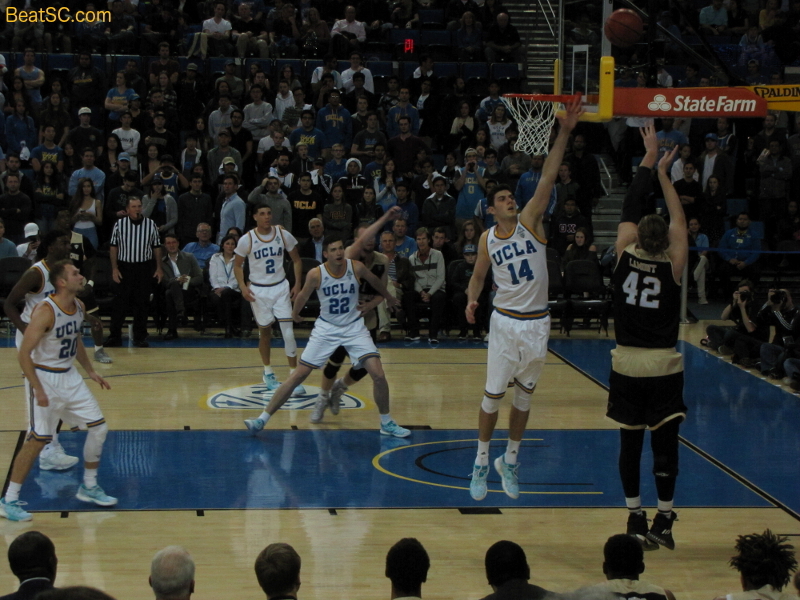 You can call Bryce the MVP, since he led all scorers, but his did miss 7 of UCLA’s 16 failed three-point attempts. I think Holiday was the key element of this win. He went only 1-for-4 from Downtown, but he made up for it inside the arc, where he was 6-for-7, PLUS he led the team with SEVEN Assists. Also, his infectious ball-hawking Defense spurred the Bruin D to buckle down in the second half. He got 2 Steals, and Hamilton had 3. Holiday has been one of the Country’s best 6th Men this season, and you don’t really need to tinker with a line-up that has gone 13-and-0. But just for the sake of discussion, if I were the Coach, Holiday would definitely be starting. 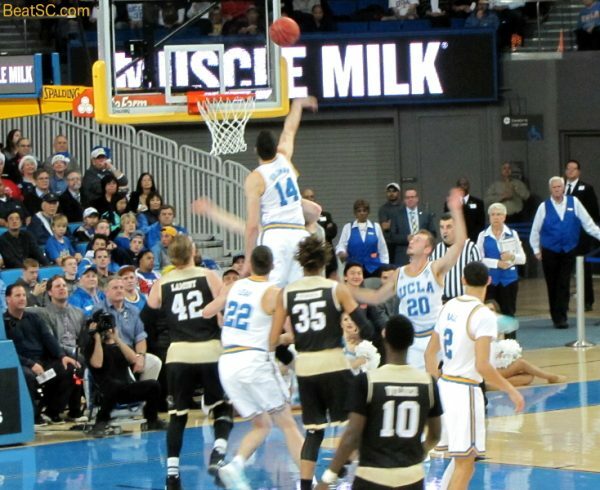 No offense meant to Bryce, but Holiday is a markedly better defender, and that’s where UCLA needs to improve. They gave up several penetrations for easy buckets early in this game. Holiday being a Starter would help set the Defensive TONE right from the opening tipoff, and that’s what this team needs, to be truly championship caliber. 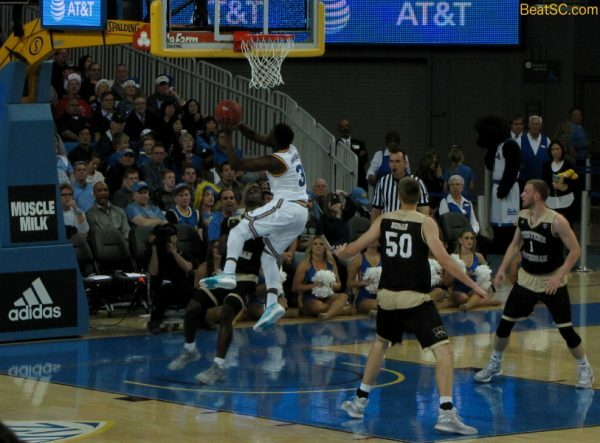 I know that Holiday has been a needed spark off the bench, but Alford could be the same. His instant offense would work like Vinnie “The Microwave” Johnson of NBA fame, who was one of the best reserves ever. And if Hamilton doesn’t break out of his shooting slump, I might consider starting Holiday over Isaac instead. But like I said, if it ain’t broke, don’t fix it, and the team just finished the “pre-season” undefeated, so I am not demanding or expecting any ch-ch-ch-changes. Speaking of undefeated, the UCLA Spirit Squad is unbeatable, and if there were ever a competition for Spirit Squads, the Bruins would have another Dynasty like the UCLA Basketball Teams did under John Wooden. Tonight, the Cheer Squad had the night off, so below, after the pics of the game, are pics of 12 of the 13 members of the Dance Team (I’m just guessing that maybe the 13th member went home for the holidays. I HOPE that’s the case and that she’s okay). 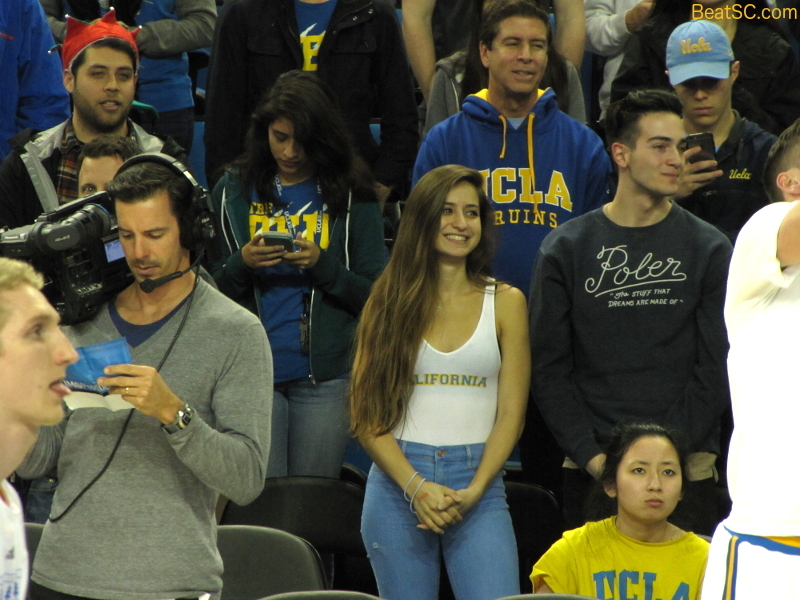 Who says UCLA doesn’t have great fans? 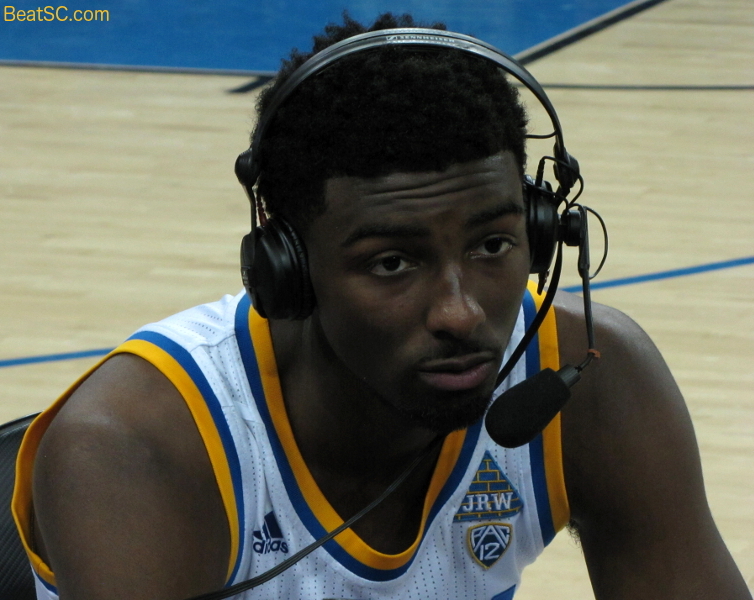 "BABY IT’S COLD OUTSIDE" was published on December 22nd, 2016 and is listed in Blue & Gold News, UCLA/usc/Cheerleader Photos, UCLA/usc/Sports Photos.